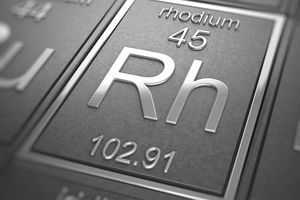 Rhodium is a rare platinum group metal (PGM) that is chemically stable at high temperatures, resistant to corrosion and mainly used in the production of automobile catalytic converters. Rhodium is a hard, silver-colored metal that is very stable and has a high melting point. Rhodium metal is resistant to corrosion and, as a PGM, it shares the group’s exceptional catalytic properties. The metal has a high reflectance, is hard and durable, and has both a low electrical resistance as well as a low and stable contact resistance. In 1803, William Hyde Wollaston was able to isolate palladium from other PGMs and, consequently, in 1804, he isolated rhodium from the reaction products. Wollaston dissolved platinum ore in aqua regia (a mixture of nitric and hydrochloric acids) before adding ammonium chloride and iron to obtain palladium. He then found that rhodium could be drawn from the chloride salts that remained. Wollaston applied aqua regia then a reduction process with hydrogen gas to obtain rhodium metal. The remaining metal showed a pink hue and was named after the Greek word "rodon", meaning 'rose'. Rhodium is extracted as a byproduct of platinum and nickel mining. Owing to its rarity and the complex and expensive process required to isolate the metal, there are very few naturally occurring ore bodies that provide economical sources of rhodium. Like most PGMs, rhodium production is focused around the Bushveld complex in South Africa. The country accounts for over 80 percent of the world's rhodium production, while other sources include the Sudbury basin in Canada and the Norilsk Complex in Russia. PMGs are found in various minerals, including dunite, chromite, and norite. The first step in extracting rhodium from the ore is precipitating precious metals such as gold, silver, palladium, and platinum. The remaining ore is treated with sodium bisulfate NaHSO4 and melted, resulting in rhodium (III) sulfate, Rh2(SO4)3. Rhodium hydroxide is then precipitated out using sodium hydroxide, while hydrochloric acid is added to produce H3RhCl6. This compound is treated with ammonium chloride and sodium nitrite to form a precipitate of rhodium. The precipitate is dissolved in hydrochloric acid, and the solution is heated until residual contaminants are burnt off, leaving behind the pure rhodium metal. According to Impala Platinum, global production of rhodium is limited to only about 1 million troy ounces annually (or roughly 28 metric tons) annually, whereas, in comparison, 207 metric tons of palladium were produced in 2011. About one-quarter of rhodium production comes from secondary sources, mainly recycled catalytic converters, while the remainder is extracted from ore. Large rhodium producers include Anglo Platinum, Norilsk Nickel, and Impala Platinum. According to the US Geological Survey, autocatalysts accounted for 77 percent of all rhodium demand in 2010. Three-way catalytic converters for gasoline engines use rhodium to catalyze the reduction of nitrogen oxide to nitrogen. Roughly 5 percent to 7 percent of global rhodium consumption is used by the chemical sector. Rhodium and platinum-rhodium catalysts are used in the production of oxo-alcohol manufacturing as well as to produce nitric oxide, a raw material for fertilizers, explosives, and nitric acid. To form bushings, which are used to produce glass fiber by drawing molten glass through holes (see photo). In the production of liquid crystal displays (LCDs) because of the higher temperatures required to melt raw materials and the quality of glass required. In the production of screen glass for cathode ray tube (CRT) displays. What are Platinum Group Metals (PGMs)? What is Tellurium Metal Used For?